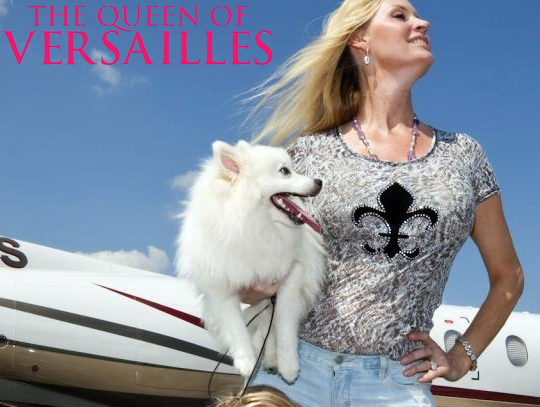 Adopt a QUEEN OF VERSAILLES Dog - An American Eskimo Dog! This year's popular documentary "The Queen of Versailles" follows a wealthy family's highs and lows... all the while including footage of their AMERICAN ESKIMO DOGS. Most people are not aware that there are many HOMELESS American Eskimo Dogs in need. Please adopt an American Eskimo Dog from your local Shelter or Rescue Organization such as Heart Bandits American Eskimo Dog Rescue. Please adopt an American Eskimo Dog from your local Shelter or Rescue Organization such as Heart Bandits American Eskimo Dog Rescue or ERU. Be sure to read all about the breed before you adopt. Eskies like to bark, they need exercise, you have to brush them regularly, they can live to 16 years old and even older, etc. But it can be worth it; as you can see they can be very devoted best friends! If you do not want to adopt at this time, you can volunteer to be a Fosterhome where you would take care of a homeless dog for a period of weeks or months until the dog finds an adopter. It is not necessary to buy an American Eskimo Dog from a breeder. There are many purebred Eskies in shelters and at rescues right now. They are available at reasonable rescue rates.